Shades of Milk and Honey is exactly what we could expectfrom Jane Austen if she had been a fantasy writer: Pride and Prejudice meetsJonathan Strange & Mr. Norrell. It is an intimate portraitof a woman, Jane, and her quest for love in a world where the manipulation ofglamour is considered an essential skill for a lady of quality. Jane and her sister Melody vie for theattentions of eligible men, and while Jane’s skill with glamour is remarkable,it is her sister who is fair of face. When Jane realizes that one of Melody’ssuitors is set on taking advantage of her sister for the sake of her dowry, shepushes her skills to the limit of what her body can withstand in order to setthings right–and, in the process, accidentally wanders into a love story ofher own. Thereare quite a few eras I’m glad I don’t live in. The Victorian era is one ofthem. It’s never appealed to me and I have never been a Jane Austen fan. I’mjust too blunt and straightforward for Victorian manners. For example, in Pride and Prejudice, Mr. Darcy is tryingto write a letter to his sister and he keeps getting interrupted. His responseis something along the lines of, “Let me convey your sentiments to my sisteranother time. I don’t have the room to do justice to your words.” While that ispolite and sweet, it is a far too long and roundabout way to tell someone toshut up for my taste. My overall impression of the Victorian era can be summedup with that. Knowingthat, you may be wondering why I chose to read Shades of Milk and Honey, since all the reviews I’ve read so farmention Jane Austen somewhere in them. The answer isn’t very exciting. I’m inthe mood for some light reading right now and I’m also looking to readsomething new and different. This book fit both categories. I will admit thatif I weren’t in the mood for something like this, I would probably have had a veryhard time with this book. 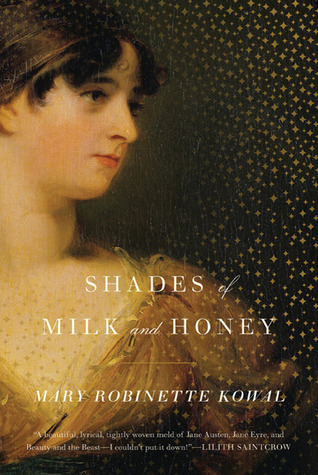 Shades of Milk and Honey will appeal toJane Austen fans. Kowal’s writing fits the period. She pays close attention tothe details that many authors would overlook. This often gives way to longdescriptions of various rooms, proper social protocol and the like. Somereaders may find this tedious, but most will probably find it charming. Due to this, Kowal never breaks the Victoriantone of the book. However, while the descriptions and style of writing wereincredibly impressive and very polished, they never caused me to feel likeanything but an observer in the events that took place, which disappointed megreatly and the world never really came alive. Thepace of Shades of Milk and Honey alsohad some problems. Due to the long-winded descriptions, the plot seemed to crawlat a snail’s pace at parts and, due to feeling like an observer while reading,I never experienced any of the charming atmosphere that many other reviewershave discussed. The slow pace made these two issues nearly unbearable at times,especially when the ending became obvious. Basically, there was a lot ofdescription and a lot of tittering about, but for much of the book, nothingreally happened. The plot itself was very straightforward and predictable. For those looking for entertainment, this will be perfect. The rest of us might feel the book lacks some important complexity. Glamour,the magic system in Shades of Milk andHoney was very quaint, but even that lacked. There was no description on how it workedbesides a mention of folds and sewing. I never had anunderstanding of glamour. In fact, it felt more like an afterthought thananything else. It was the addition of glamour that brought this book fromfiction to fantasy. However, due to the fact that it was such an important partof the plot at various points, glamour really needed to be more fleshed out andunderstandable within the context of Kowal’s world. Kowal’scharacters were about as interesting as her world, but like her world, theyweren’t very fleshed out or well rounded. It was interesting to see the worldthrough Jane’s eyes, but the emotional distance between Jane and the reader isso vast that she never really becomes real or alive. In fact, Jane seems morelike a means to an end. She’s a way for the reader to read about events thattranspire, but there isn’t much more there. Many of her actions, specificallyregarding the ending made no sense in the context of Jane’s previous actions ordecisions. Despiteall of these issues, Shades of Milk andHoney was enjoyable for those who are willing to appreciate it for what itis: a surface level read good for entertainment, but not for deep thought. Fansof Victorian manners and/or Jane Austen should check this book out. Kowal’swriting is charming and her research of the period is obvious and thorough.However, when looked at a bit closer, Shadesof Milk and Honey is average. It lacks depth, the world and charactersaren’t well rounded and the magic system seems dropped in on a whim and rathernonsensical. It’s worth giving this book a shot. It’s a very quick read thatjust might surprise you. Previous PostDiscussion: A Netflix type service for books? I've never been a fan of these kinds of books, shoehorned magic system or no. But it'll make a damn good Christmas present for an Austen/fantasy fan I know 🙂 Thanks for the review! I actually didn't think I'd enjoy it and did. Her prose is beautiful. I was a but frustrated by the lack of detail to explain the glamours, but I full expect her to correct that in later books. I thought the story was well told and a fun, quick read over all though.